A few words from Marilyn Brindley (aka Little Nell): Whilst Alan is away I'm stepping in as admin and I hope you all enjoy the prompts I've chosen for the next few weeks. 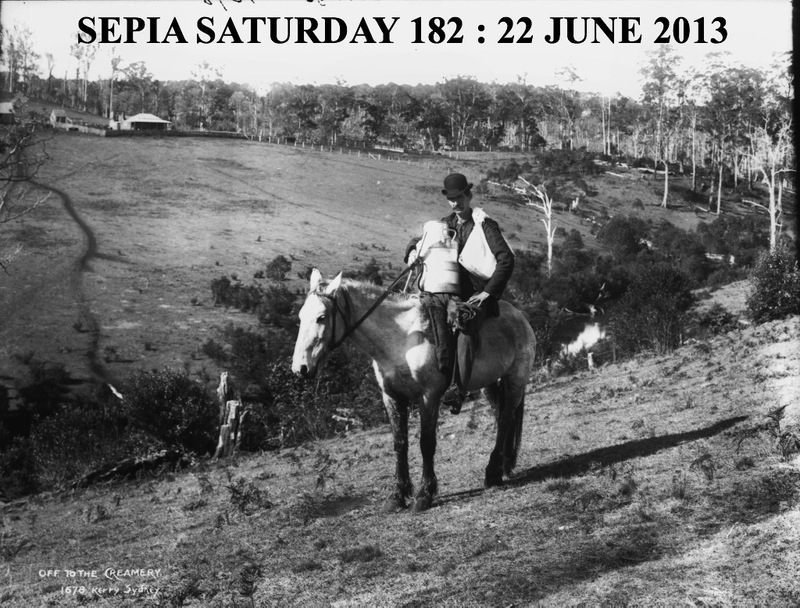 The value of our Sepia Saturday Facebook group page was never more apparent than a few weeks ago when Mrs Marvel, of Who Were They, posted this link for we ‘Sepians’ to enjoy. The wonderful pictures there of chatelaines made me think about our theme for this week. 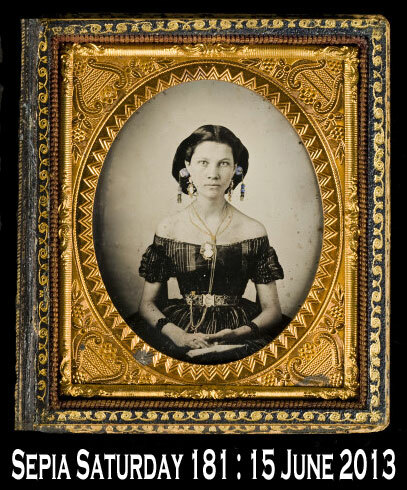 We haven't actually had bodily adornments of any kind as a prompt before, so this rather lovely image, 'Portrait of a woman with elaborate cameo jewelry and off the shoulder dress' from SMU Central University Libraries vis Flickr Commons is the one I've chosen. It's from around 1850 but nothing is known about the creator or sitter. I'm sure the photo sleuths amongst us would be able to tell us more but I'm not much of a detective myself. All that we ask for now is that you post your own response to Number 181 on or around Saturday June 15th. It's time to open your jewellery case and dig out some sparkling images. We're looking for any bodily adornments: from girls with pearl earrings to gents with an impressive medal collection (or vice versa), even tattoos would fit the bill I'm sure. Don't forget to link back to this Sepia Saturday page or add the mini-banner at the bottom of this post if you prefer.When you've posted on your own blog, add the link to the specific page here on Mr Linky, leave a comment too please, and then try to visit as many other Sepians as you can. Now, before you become completely dazzled by the 'bling' take a peek at the next two week's prompts. 182: It's 'Off To The Creamery' this week c1900. The possibilities are endless: bowler hats, milk churns (or dairies) men (or women) posing on horseback, Australia, farms or any combination of these. 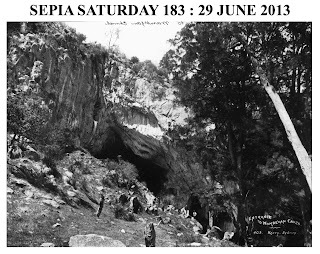 183: This 'Entrance to Wombeyan Caves' in New South Wales could take you into grottoes, caverns, or mines of information. Or it could you leave you completely in the dark - so bring a torch! What strikes me about the picture is that her arms are uncovered. Rather unusual for the period where they seemed to muffle themselves up no matter what the weather. I suppose it might have been an evening dress....? Interesting. I would like to know more myself. More information about Ethel on my post. My post is about Native American jewelry. Another lengthy one this week, but I'm sure you're all used to that from me by now. Jewelry and a hairy tale from me. Thank you for the inspiration image! Again, I followed a different path this week. My interpretation, which is entitled Bejewelled, will appear on Saturday. I love that off-shoulder dress and the tiny waist. What an interesting prompt this week! I got mesmerised by the Crown Jewels. Oh I'm tickled to have been mentioned! Wouldn't you know my photo features men in necklaces, not a woman in sight! That's a very interesting site about chatelaines! Thank you (and Mrs Marvel). Hi everyone - pleased to be able to contribute this week. Hope you're all well. Found a broach in the family album but the wearer show plain against this weeks prompt. A little bling through my family history. My gals finery has seen better days. What you find in boxes. It was a fun page this week. Tricky topic this week but found a couple of adorned relations. An interesting theme this week. I too found very little jewellery in my albums. Hello Marilyn, Thank you for all the things you do here at SS! You are well appreciated. I wish I could say I missed posting here because of my world travels, (Ha! Ha!) but I can't. I did get a post in today and it has a thin lingering hanging on for Father's Day which is tomorrow here! Enjoy your weekend! 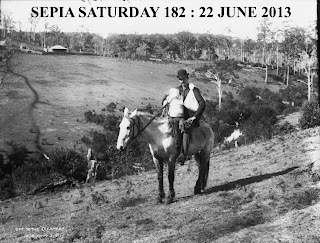 For more "odds and ends", please visit the Sepia Saturday blog. Better late than never. . . me with a tribute to dads in my life for Father's Day in the U.S. I almost missed this week, because when I looked through my family pictures, no jewelry to be found! Oh dear! So I switched to family gold...the treasures we do have.